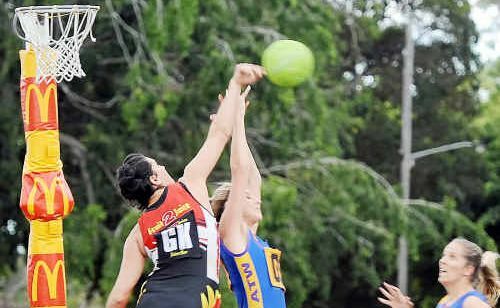 ACROSS The Waves Gold outgunned a fired-up Blazers, while Hervey Bay ended Alloway Blue’s grand final aspirations in a high-quality Saturday afternoon at Daph Geddes Park. Waves’ 48-34 win went according to script, but they had to overpower an early onslaught from Blazers, eventually finding their groove to control the second half of play. A perfect 11 from 11 in the second quarter from goal shooter Ruth Mathiesen helped establish a healthy lead, while a tactical change to bring on Poppy Larson to cover the in-form Ainsley Ackerman also helped. “Poppy had some extra height that we needed,” coach Sandy Baker said. Baker rated Blazers’ effort as their best of the season. “It was a tough game and the first two quarters were very intense and very fast,” she said. Gold now have a week off to think about the big grand final, but have been there so many times it is nothing new for a bulk of them. They will watch next week when Hervey Bay Cosmos take on Blazers for the last remaining grand final position. The Cosmos can lay claim to being the form team in the competition, with back-to-back wins over Alloway Blue propelling them into the semis and then straight past them. This time they won 41-34, showing enough form to worry Blazers ahead of their preliminary final this weekend. Injuries derailed their debut in the Bundaberg competition last year, but a fresh squad and some confident juniors means they will be more than worthy opponents for Blazers next Saturday.